Beyond Shame and Guilt – Hello Korea ! Thursday I went to hear Jane Jeong Trenka speak at the Korean Women’s Development Institute. First off, it’s really great there’s such a think as a Women’s Development Institute in Korea. Second off, it was kind of amazing none of them had really heard much about the adoption issues Jane spoke of. Third, it was great they were so receptive, that they were feminists, and that they spoke and thought like academics of the highest caliber. One part of Jane’s presentation that shocked them the most were the numbers – the U.S. child poverty rates (20.6%) compared to the S. Korean child poverty rates (10.7%), the fact that the CEO of Children’s Home Society (the largest of the adoption agencies allowed to broker adoptions in Korea today) made $190,000 in 2005, that the cost of adopting a child can be anywhere from $15,000 -$50,000, and that the Adoption industry revenue in 2000 in the U.S. was $1.5 billion. Two things that stuck out for me from Jane’s presentation were – that if you think about the 160,000 (that number is from 2006 and doesn’t include private adoptions or early unrecorded adoptions) to reaching 200,000 children that were adopted out of the country, that equals 400,000 parents and then extended family that probably equals more than a million. And of those million people, most are silent. She likened our cause to that of the comfort women, those women who were forced by the Japanese to service them during the last occupation. Like them, everyone knew about their plight but everyone was too ashamed for doing nothing about it to address the issues, so their stories didn’t see the light of day for decades. And the other thing that stuck out for me was talking about recognizing that these adoption agencies are neo-liberals, privatizing and profiting from what should be a part of a public social welfare system, that the government should take responsibility for. The principles of economic liberalism, notably the encouragement of open access to global free markets for goods and labor, has likewise helped to transform transnational adoption from a small-scale humanitarian intervention to a global industry in which international enterprises compete for resources and market share. Configuring consumer choice as a key right of the individual, economic liberalism (especially during and after the 1970s) has not only encouraged the international transfer of children, but has encouraged adoptive parents to approach the adoption process as an act of consumption in which adoption fees are exchanged for the custody of a suitable child. On a trnasnational scale, this process, sometimes referred to as “globalization,” confers a kind of global citizenship through participation in a global marketplace. OK. So that’s obvious to me, but maybe you hadn’t thought of it in those terms, and I thought it was especially well written so I wanted to share that with you. One of the panelists who was there to ask Jane questions was an academic named Eun Kyung Min, who has done some scholarly analysis of mother loss and exchange in Freudian terms. Her path to this research was especially interesting and underscored the blackout and denial of Korean society regarding adoption. Ms. Eun had been studying in the United States with her baby daughter in tow and began to experience a lot of unsolicited attention as people cooed over her adorable Korean baby. What came as a surprise to Ms. Eun was not the attention, but the sheer frequency and number of references to Korean adoptees these people were connected to, that initiated the contact in the first place. For Ms. Eun, and probably most Koreans, she had no idea how large the scale of these operations were. She began to wonder how many adoptees were sent abroad, why they were orphaned, and why had she not heard about any of them while living in Korea all her life? Also learned Thursday that there is an unwritten quota system going on here: that the much touted domestic adoptions finally exceeding international adoptions is actually a negligible overtake and is really just a way to keep the naysayers happy and continue to allow at least that many international adoptions. For every one domestic adoption taking place, they are allowing an international adoption to take place and allowing just slightly more domestic to make it look good. There is no real plan to eliminate international adoptions as long as this backroom quota agreement with someone (hmm…whom could that be?) is allowed to continue. And so, popular opinion must be turned. We have our work cut out for us. It is clear, from all I see and hear, both at this discussion and with my awkward conversations (or lack thereof) and responses (lame excuses) with native Koreans, that Jane’s Truth and Reconciliation for the Adoption Community of Korea is an organization whose time has come. And me, always miss missed the boat, miss too late, is here just in time to help make a difference. So Friday I gave an interiew to a Korean magazine, next Saturday I am attending an opening art exhibit on returning adoptees, along with the partial pre-screening of Resilience, a documentary movie being made about birthmothers who have reunited and what they have gone through from the beginning to now, and Sunday I help Jane with a giant puppet (a giant birth mother made by a local artist) for a demonstration for Korea’s fourth annual adoption day. Must find/make a way to participate. It’s very very important. Oh, and btw, the incredibly impactful film Adopted, the movie, can now be downloaded for less than $10.00. 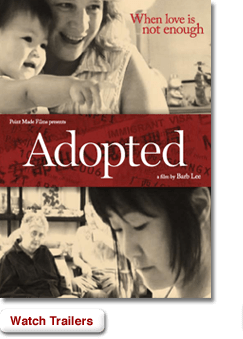 This is a MUST see for anyone considering adoption. It follows one western family about to adopt, and it follows an adult Korean adoptee and her attempts to have a meaningful relationship with her adoptive parents. i love continuing to get your perspective on adoption! it’s just something i never would have thought much about had i not met you, and i’m so glad!! is the art opening or pre-screening of that film open to the public? if so can you give me some details, i’m interested in going! thanx for sharing, for realzzz. hope you’re having a good holiday! hey you’re back! how was it? I was wishing I had gone, and yet also it was somewhat freeing to know everyone I knew had made their own plans, so I just wandered in silence around Jongno, and it was good and I mean to do it again. Yes, the thing is at the Gyeongbukgong art center at the geyongbukgong subway station next Saturday at 4 pm. Love to have you there with me! Oh yeah – and if you can get up REAL EARLY on Saturday, there is a friends walk around the restored stream. For 15,000 won you get straw shoes, and a paper fan, and a bag with a drink and a snack in it. You’re supposed to walk around and make as many friends as you can and write their names on the fan. It starts at 9 am. and then around 10 is the walk, which takes about an hour. I’ve added the public invitation to the post above. I’m always happy to share my perspective on adoption! Becoming radicalized has been a long process, but I pride myself on being more than just an angry adoptee, but one that can speak about it in a rational manner. Yeah, I heard Adopted the Movie was -intense-. Where can it be downloaded at for less than $10? Click on the Adopted the Movie image above, and that takes you to their website. At the top menu, there is a menu tab called “WATCH” which becomes a pull down menu and there is a “download film and bonus video” option to click on. I’m really glad it’s more affordable now. I’ve watched all those youtube clips many times – intense is a good way to describe it. I love how a picture speaks a thousand words too. I can talk about the complications of adoption ’til I’m blue in the face, but just a few minutes of this film and people can no longer be naive. A great piece of work, and from what I’ve seen a fair and accurate portrayal of what it is to be adopted and adopting internationally.